Save Georgia's Hemlocks, a 501(c)(3) nonprofit, is a rapidly growing grassroots organization of energetic individuals with diverse backgrounds, interests, ages, and origins, united by a common purpose to save the hemlocks. We began our efforts in July 2009 with a large goal -- to serve all of north Georgia where the woolly adelgid is a serious threat. With the help of many volunteers and partners, we have made remarkable progress since then, but there is still much to do to preserve and protect as many of these valuable trees as possible for the benefit of everything that depends on them and everyone who loves them. As an organization, SGH is characterized by a proactive approach to caring for the environment, a culture of inquiry and independent thinking, appreciation of diversity, respect and transparency in all our interactions, creativity and results-oriented hands-on engagement, conservative financial practices, and high ethical standards. Please join us! There are many different ways to get involved -- a little or a lot. We invite you to get to know us, find your special role in this important cause, use your time and talents to serve in meaningful ways that will have a positive effect for years to come, and share the fun. Hemlock Help Line 706-429-8010 to let us know of your interest. LOOKING FOR A FEW GREAT PEOPLE! * at least nine more Lead Facilitators in counties across north Georgia. to let us know of your interest. Thanks! 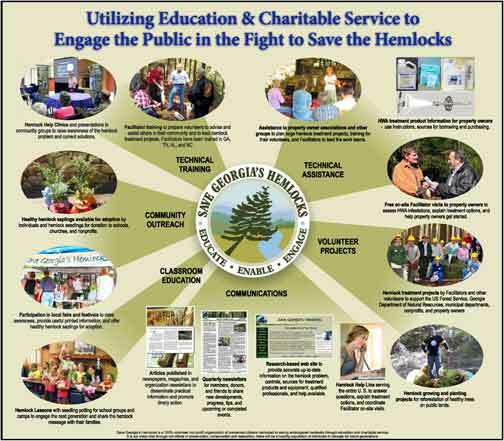 SAVE GEORGIA'S HEMLOCKS is a 100% volunteer, 501(c)(3) nonprofit organization of concerned citizens dedicated to saving endangered hemlocks through education and charitable service. Through our efforts of preservation, conservation and restoration, there will be a healthy population of hemlocks in Georgia for future generations. ■ Do all for the benefit of property owners and their hemlocks with no benefit accruing to any participant. ■ Operate in the most efficient, cost-effective manner, adhering to nonprofit standards of excellence and best practices. ■ Do all with simplicity, transparency, and the spirit of charitable service. We are a fiscally conservative 501(c)(3) nonprofit organization and promise to use your gifts very carefully. Our budgetary goal is to keep overhead expenses to 10% or less in order to devote 90% or more of our resources to clearly defined program activities; however, our actual performance for FY 2009 - 2018 has averaged 91.81% for education and charitable service and 8.19% for overhead. Our books are open to public inspection upon request. It is our intention to keep the organization lean, proactive, community-based, and uncomplicated. We welcome all individuals and groups who share our vision to save north Georgia's hemlocks for this and future generations. Click here to meet our SGH Leadership Team (as of 2/9/19). ■ Enable -- Ensure easy access to sound hemlock-specific instruction, advice regarding economical solutions, and availability of necessary resources. ■ Engage -- Enlist our volunteers to provide direct assistance to property owners, nonprofits, and public land managers. Our Program Description sets forth the problem statement, program goals and objectives, services and scope, and implementation plan. To learn more about the features of the program, how to use the services, and how to participate as an individual or group, please visit the Hemlock Help page. ■ Education -- Provide educational resources, programs, and activities that reach and benefit members, volunteers, and a wide range of constituencies in support of saving the hemlocks. ■ Communications -- Develop messaging materials and methods that raise awareness, provide accurate and up-to-date information and instructions, and respond to requests for advice and assistance. ■ Service - Treatment -- Manage service activities to enable property owners to do as much as possible for themselves as possible and to deliver direct volunteer assistance on private and public lands as our resources permit. ■ Service - Saplings -- Maintain distributed nurseries of healthy hemlock seedlings and saplings and conduct service activities to promote the planting and care of new hemlocks on public and private lands. ■ Membership & Partnership -- Create and nurture relationships with individuals and other like-minded organizations to support achievement of our shared goals and objectives, multiply our ability to educate and serve, and provide future leadership. ■ Financial Management -- Provide appropriate guidelines, oversight, and management of financial resources, records, and risk. ■ Administration -- Manage business aspects of the organization to ensure effective and efficient operation and compliance with applicable authorities. Steady Progress for 10 years! The years since 2009 have been an exciting and productive journey with the level of awareness about our threatened hemlocks rising to an all-time high and so many wonderful people coming forward to join the battle to save the trees. Our momentum and membership have grown substantially, and we expect that trend to continue. FY 2019 to date -- Below are the highlights of our activities and accomplishments in FY 2019 through 3/31/19. Click here for the full details. ■ Total spending in FY 2019 to date: 71% for educational & charitable service programs; 29% for administrative, membership & fund raising. The higher than usual number for overhead is due to fees payable at the beginning of each year and is expected to return to our normal 10% range over the next two quarters. FY 2009 - 2018 -- Please see the Archives page. The next few years are likely to be the "tipping point" for the hemlocks in Georgia, and there is much to do! With the adelgid's prolific reproduction rate and the limited financial and manpower resources facing our public land managers, the hemlocks are at a major disadvantage. Private property owners and volunteers will play an important role in the very survival of the species. In FY 2019 we are planning an aggressive schedule to offer educational events in all our program counties, continue our support of the U. S. Forest Service and Georgia DNR hemlock treatment projects, increase our focus on partnerships and youth activities, expand our distributed hemlock sapling nurseries, and do more projects for hemlock restoration on trout streams and other public lands. Please click here for a FY 2019 Strategy Overview, and see the Schedule of Events page for details. SGH Leadership Team meetings are held quarterly, usually on the second Sunday of the calendar quarter. We welcome the participation of all interested parties. We also ask that all of our Lead Facilitators join us for each of these quarterly meetings because as the scope of our programs expands, your input and participation will be more important than ever. Our next Leadership Team meeting is scheduled for Sunday, July 14, 2019, starting at 1 p.m. at the home of Donna Shearer. An agenda will be posted here prior to each meeting, and notes following each meeting in the current year will also be posted here. For meeting notes from last year, please see the Archives page.